Miss Pennsylvania Katie Schreckengast, 2018 PSECU Chips In Golf Outing Honorary Chair, poses for a photo with the winning foursome from Lamar Advertising. Pennsylvania’s largest credit union, PSECU, hosted 116 golfers for its second annual PSECU Chips In Golf Outing on Thursday, June 7 at Dauphin Highlands Golf Course. Supported by 26 sponsors, the event raised $36,220 for this year’s beneficiary – Children’s Miracle Network Hospitals®. Proceeds raised will be divided equally among five Pennsylvania-based Children’s Miracle Network Hospitals, including Penn State Children’s Hospital in Hershey, Children’s Hospital of Pittsburgh of UPMC, Children’s Hospital of Philadelphia, Geisinger Janet Weis Children’s Hospital in Danville, and Children’s Hospital at Saint Vincent Hospital in Erie. Following breakfast and a warm-up period for participants, the golf outing began with a shotgun start at 9 a.m. An awards lunch concluded the event. Listed below, sponsors were integral to the success of the second annual PSECU Chips In Golf Outing. Children’s Miracle Network Hospitals raises funds and awareness for 170 member hospitals that provide 32 million treatments each year to kids across the U.S. and Canada. Donations stay local to fund equipment, services, research, and charitable care. “We are so thankful for PSECU and the funds raised on behalf of five Children’s Miracle Network Hospitals in Pennsylvania. These funds are critical to saving lives in the local communities where PSECU employees and members live,” said John Lauck, President and CEO of Children’s Miracle Network Hospitals. Learn more at CMNHospitals.org and facebook.com/CMNHospitals. In 2017, the inaugural PSECU Chips In Golf Outing raised $17,311 for the American Heart Association and the American Stroke Association. 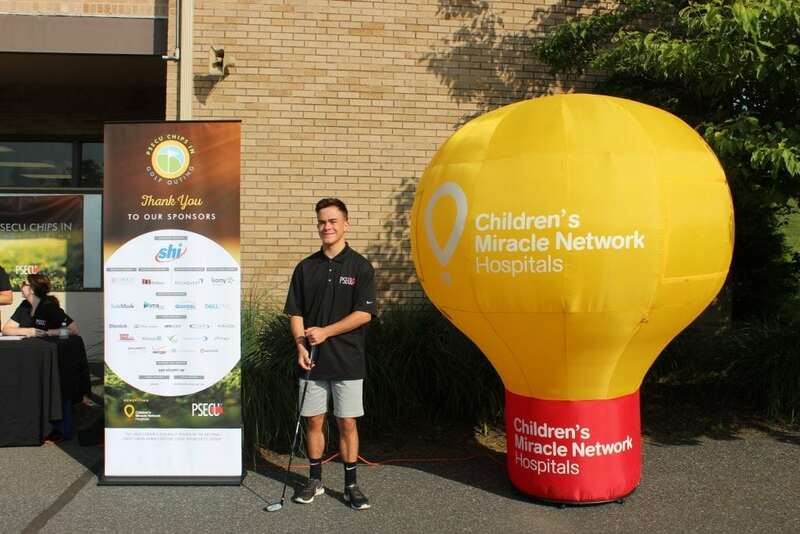 Miracle Teen Sam, who was born at 27 weeks and receives ongoing treatment at Penn State Children’s Hospital, golfed in the outing.